Maifanshi Aqua Foundation was created to mimic the post-facial glow. With radiance in mind, the Aqua Foundation is infused with a RGB powder that enhances the natural tone of the complexion for a brighter and poreless skin texture. I hope you find this video helpful! I am ordering a full size ASAP of shade 213 because it is the most yellow in my opinion. It also has a greenish/olive undertone which is great to cancel out the redness on my skin! I've heard nothing but great things about this product, and I would love to try it. Its EXTREMELY disappointing they don't have dark skin tone shades. They didn't even try. I love this foundation! it is so moisturising on the skin, makes your skin feel hydrated without feeling greasy and never caused any breakouts onmy sensitive skin. Gives you that "your skin but better" look and i would say it is very similar to GA Luminous Silk however the coverage is a bit more on the sheer side in comparison. the foundation is buildable to come close to a medium coverage but if you are looking for full coverage this is not for you. 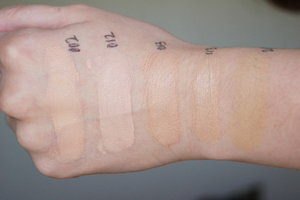 I use 213 which is yellow toned suitable for NC25 skin. After about a month of research and staring at swatches online, I finally bit the bullet and ordered shade 213. Oh man... I wish I would have bought it sooner! 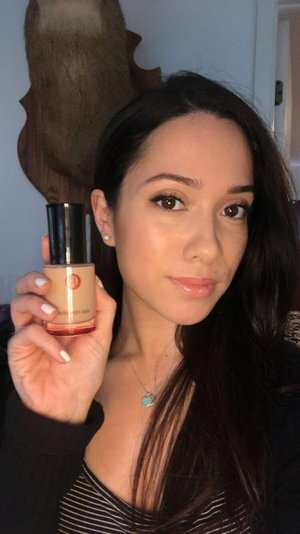 I'm a bit of a foundation/tinted moisturizer junkie, but the Maifanshi Aqua Foundation has completely satisfied my fix. The formula is very watery and feels like absolutely nothing on my sensitive combination skin. I find it sets to a beautifully radiant satin matte finish that doesn't accentuate my oily t-zone, and actually makes my skin look BETTER after hours of wear. I find 1 and a half pumps gives me a true medium coverage. I've worn this foundation to work everyday for the past week, and find it works very well over my SPF 30 moisturizer. I've tested it with and without setting powder and find it works well both ways; though I would recommend using powder very sparingly so as to not diminish the beautiful glow this gives to the skin. I apply this foundation at 7am and it still looks beautiful by the time I get home at 6pm. I was originally torn between shades 123 and 213, and I'm glad I went with 213. It's a yellow-based beige that perfectly evens out my NC25-30 skin. Being that it's summer at the moment, I'm more towards NC30 and 213 is just a tad light, but I find a little bronzer fixes that. If you've been on the fence about this foundation, please do yourself a favor a try it! I promise you won't be disappointed! This is a beautiful foundation! When applied properly, it gives the skin the most gorgeous, moisturized feeling. It's like you're not wearing anything at all. It's important to apply it with the fingers or with a stippling brush, as opposed to swiping it on with a brush or swooshing it around in circles. I found that fingers work best. The other thing to note is that it shouldn't be used over a silicon-based primer. I prefer to moisturize first and then apply it (skipping a primer). When used over silicon, it can separate and go on unevenly. This gave me pause because my SPF is in my primer, but I used a facial sunscreen underneath instead and then applied the foundation over top. That worked perfectly. My favorite part about how the Aqua Foudnation wears over the course of the day is that it doesn't settle into the pores or accentuate them. It just looks like you have beautifully moisturized skin that has an amazingly even tone to it. I actually got a few samples directly from the Koh Gen Doh websites (actually asked for some via their instagram account). =( I am so glad that I got the samples before I bought it! I originally thought I would be a 123 because of what a previous reviewer said. However, after trying both 113 and 123 on each side of my face and letting it sit for a bit, I realize that this foundation oxidizes a bit (give it a few minutes), making 113 the perfect shade for me. 123 ended up being slightly too dark, perhaps more of my summer shade. In sum, the color difference before 113 and 123 is not that drastic. For me, I prefer to be a little lighter than darker and so I went with 113 since it suit my skin perfectly. Beside that, this foundation is amazing!! It feels like SKIN!! While letting the foundation sit to see if it would oxidized, I actually had to question myself if I was wearing foundation. It's that amazing!! I'm pretty smitten with this little bottle so far. It truly is the ultimate Your Skin But Much Better look for me. Even better than that. . . I have recently had horrendously sensitive skin and this stuff doesn't bother me a whit. Not an itch, not a red spot, not even a blemish the first few days of using for the first time. That is entirely unheard of for me. I got it in 113, which is a hair light and a hair yellow for my challenging skin tone but it blends well enough to still work. Next time I'll try 213. And there likely will be a next time. A few weeks ago I bought a department store foundation at the same price point because it was a rare perfect color match. But when I compare that to this one, the known brand leaves me with a face I would describe as "OK." The KGD leaves me with a face that is ever so subtly transformed. I'm not going to use the word youthful. I'm in my 40s and nothing short of an OR is going to restore my 20s skin. But this stuff does good things with what I've got. When I first opened it, I thought I would use it mostly for special occasions. Instead, I find myself reaching for it every day . . . Honestly, I never thought any foundation could resemble skin when inspecting it closely. This one does the job. Mind blown. Skin in a bottle. It's substance is a bit liquidy and a little goes a very long way; the best result for me comes when applied with the fingers. The coverage is more medium than full, but that's fine with me, all I want is to get rid of some redness and the combo with my favourite green primer and finishing powder is beyond amazing. Goodbye, pores! The color 002 may look like it has a hint of pink when you get it out of the bottle but once I spread it out it blends really well with my neutral skin tone. The best thing is where every other foundation I tried tends to migrate or separate on the skin during the day, especially on both sides of the nose, this one stays put like a soldier loyal to the end. Gorgeous satin finish, mimics my skin in both color as well as texture, couldn't hope for more. I rest my case, would buy again and again! First, let me tell you that Beautylish's customer service is top notch. They offer a great service, very fast shipping to Canada 🇨🇦 for only 10$ 2-3 days shipping. I received my Koh Gen Do foundation in a really pretty box. They even wrote me a personalized note. I felt special. I will be repurchasing makeup here for sure. The coverage is definitely sheer to medium. I really love the consistency. It feels so great on my skin. It is dewy and luminous but in a really good natural way. I prefer the Koh Gen Do to my GA luminous silk. The pictures looks amazing. My boyfriend kept on telling me how pretty I looked today. He's not a fan of makeup, he prefers when I am not wearing any. I really recommend this foundation! I have combination skin, sometimes dehydrated.. the Koh Gen Do is my new holy grail and I don't think I will ever find another that beats this one. I will be purchasing other Koh Gen Do produts, they had me! i was a little anxious about purchasing this foundation online as there wasn’t a lot of choice in the shade range, but thankfully, the shade 012 works really well with my skin-tone. Firstly the packaging of this is really weighty and the glass-bottle design is quite chic. It’s definitely not one to travel with due to its size and weight, but it does look lovely on your dressing table and is a pleasure to use. The foundation itself is super lightweight, yet delivers a medium coverage on first application. I researched the ingredients in this before purchasing it and found it to contain jojoba seed oil, olive squalane and shea butter which i think all attribute to its smooth and runny consistency. it is also free of mineral oil which is a plus. 1 pump of the foundation managed to cover the majority of my uneven skin-tone, redness and little blemishes. But i still had some freckles and larger acne scars peeking through. What i love most about this product is that it doesn’t ever look cakey. Ive used it for consistently for over a month now since i bought it and no matter how much i pile on (there are days when layer of foundation are required ok) it doesn’t ever look cakey or heavy or unnatural. It still manages to look like skin while softening and smoothing out uneven skin texture and pores. The finish is dewy, so i suggest a powder if you have oily skin.